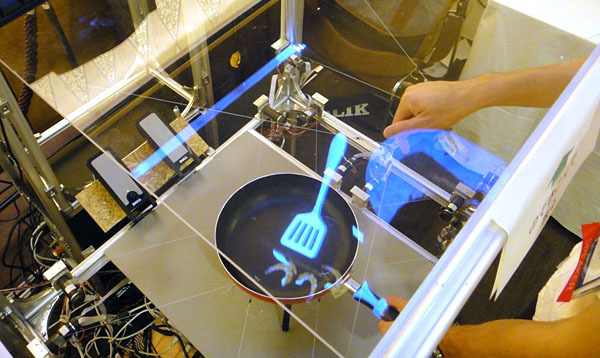 Tokyo Institute of Technology developed a crazy system for anyone wanting to train and improve their cooking skills. In Japan, there is no shortage of good food. After all, Tokyo leads the world as the city with the most Michelin Three-Star restaurants. Now, Japan is applying their technology to the culinary art of training. What a surprise today to discover that there is no more need for chefs to train their protege. The 3D simulator is the new teacher and teaches chefs-to-be everything they need to know. The simulator calculates the heat transfer from the pan to the meat or vegetables that are being cooked and displays the visible changes caused by heating. The frypan interface allows for three-dimensional input and as well as moving the frying pan to aid the cooking process. The simulator can feed back the weight of the ingredients combined with the tactile feeling of frying them. I guess that only thing it can’t do is simulate the smell of burnt food when you mess up.